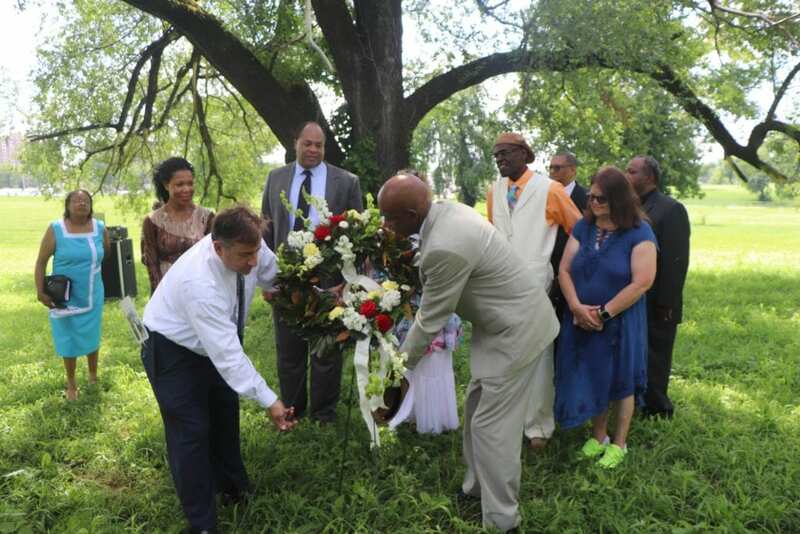 NASHVILLE, TN — Ministers, train buffs, and historians met Sunday under a shade tree at Mount Ararat Cemetery to commemorate the 100-year anniversary of the worst train wreck in U.S. history. Council members Erica Gilmore and Jim Shulman attended the service. “Today we are gathered to remember those who were laid to rest here due to the worst train wreck in Nashville July 9, 2018,” said Pastor Denise Yeargin. Some 17 unidentified African American men are buried in the Potter’s field at Mount Ararat Cemetery. Pastor J.J. Greene prayed for the victims and for a statue to be erected in the grassy field to remind people of the struggle and sacrifice those men made. On Sunday July 8 a wreath was placed near the field where 18 unidentified victims are buried in Mount Ararat Cemetery. “We want to commit their bodies. We want to commit their remains and we want to raise their memories. Their names may be unknown but today their deeds get to live on,” said Pastor Enoch Fuzz of Corinthian Baptist Church. Two trains collided head-on in Belle Meade at 7:20 am. The crash was heard two miles away and the carnage was so horrific it unhinged George Scott who somehow survived the crash but wandered around Nashville in bloody clothes for 3 days in shock. 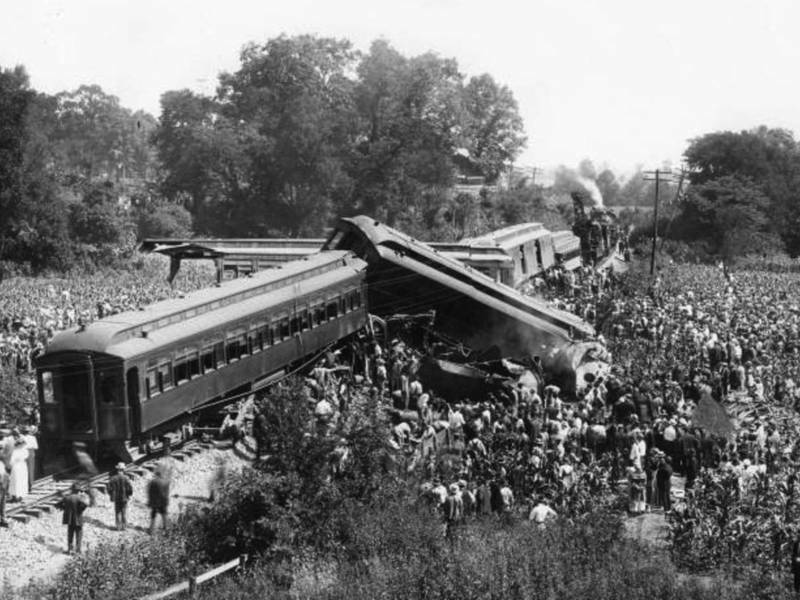 The worst train wreck in U.S. history occurred July 8, 1918 in Nashville. “The scene immediately following the collision is indescribable. Those escaping unhurt or with lesser injuries fled from the spot in a veritable panic. The cornfield on both sides of the track was trampled by many feet and littered with fragments of iron and wood hurled from the demolished cars. The dead lay here and there, grotesquely sprawling where they fell. The dying moaned appeals for aid or, speechless, rolled their heads from side to side and writhed in agony. Everywhere there was blood and suffering and chaos.” From a story in The Nashville Globe, an African-American newspaper. We were in a world war then and black farmers from Arkansas, West Tennessee, and Mississippi left their fields to volunteer at the Dupont munitions factory. They were coming to Nashville to help the war effort although most couldn’t vote and few could read. Those were Jim Crow days and Negroes were segregated in the third car behind the engine and baggage car on both trains. Being so close to the engines cost 68 black men their lives when the trains collided. The cars near the engines suffered the most casualties. “The Day the Whistles Cried” by Betsy Thorpe took seven years to research and another five to write. The 251-page book was published in 2014. Thorpe said a series of fateful coincidences led to the wreck and if any one of them had been different, the two trains would not have collided. There was a shift change happening at the time of the wreck, a Westbound train left Nashville ten minutes late and the inbound train was also late. 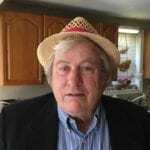 David Kennedy, who had 50 years’ experience and a spotless safety record, took the westbound train from the multiple tracks onto the single track. He died in the crash. Many experienced railroad workers had been drafted and their replacements were green. The federal government had taken over railroad operations, changing routes, schedules, and some of the rules. One of the new rules to visually inspect the track ahead wasn’t followed that day. “You know what’s it’s like when you get a new boss and they change everything,” Thorpe said. Tower operator J.S. Johnson gave Kennedy the “all clear signal” but soon realized the two trains were on the same track. He sounded the emergency whistle but nobody heard it, and the two trains hit with an impact of more than 100 mph. The death toll was between 101-121 and 171 were injured. Pastor Gwen Brown-Felder sang “Swing Low Sweet Chariot” to remember the people who died on that fateful day. “I can imagine those who came to their end as the engine and the train collided. They may have heard or seen a chariot come to pick them up,” she said.